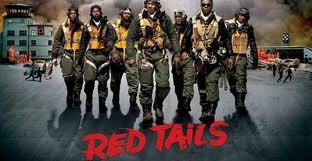 The reviews for ‘Red Tail’ fly all over the place. Some praise the George Lucas production for putting the Tuskegee Airman at the center of a stirring World War II narrative, something rare in the movies. Others are critical of the liberties taken by screenwriter John Ridley, calling his Tuskegee characters one-dimensional and inaccurate. Washington Post columnist Courtland Milloy is particularly scathing, calling it “egregious” that the filmmakers portrayed the airmen as clowning around in their cockpits and making dogfight maneuvers that broke the laws of physics and common sense. But such will ever be the case. The storytellers will use anything, even historical events and persons, as the grist for their entertainment mill. And if they think the real thing is too “dull” (like the actual battles of the Tuskegee Airmen!!?? ), then they, in their infinite wisdom and employing consummate skill, will embellish and embroider reality into something that will better fill their bank accounts.